Eschweiler/Hamburg, 29 August 2018 – Garbe Industrial Real Estate GmbH and the Aachen-based logistics company Hammer GmbH & Co. KG today celebrated the roofing ceremony for the new logistics centre in Eschweiler, Germany, together with numerous guests from politics and business. The new facility, which is being built on a 186,000-square-metre site in the intermunicipal business park of Inden/Weisweiler “Am Grachtweg,” is scheduled to be completed by the end of the year. It will be home to a logistics property almost 94,000 square metres in size, which will provide 105,000 square metres of floor space, including an additional mezzanine, offices, and social rooms. “We are investing a total of around 60 million euros in the project,” says Christopher Garbe, managing director of Garbe Industrial Real Estate GmbH. The Aachen-based forwarding and logistics services provider Hammer will occupy the modern logistics facility. 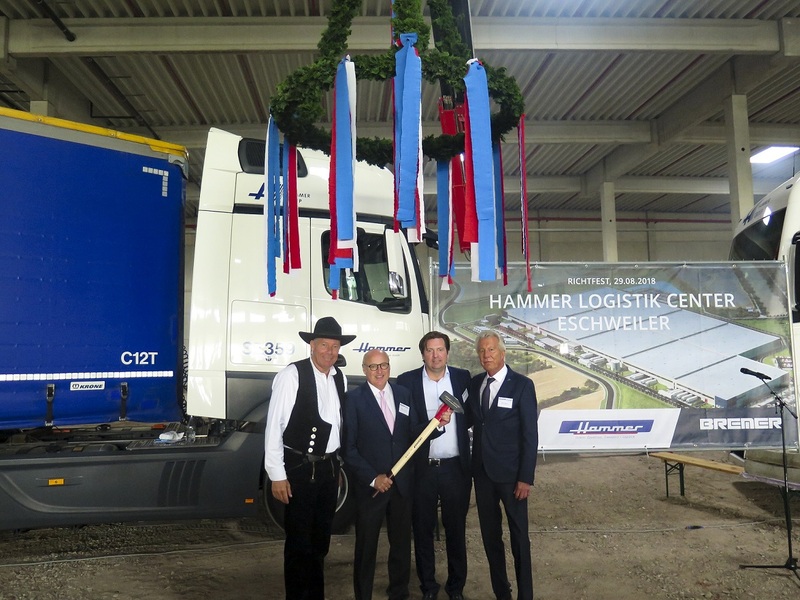 “As a multi-user location, the logistics centre Eschweiler is unique in the region and an important building block for further growth for us,” says managing director Wolfgang “Tim” Hammer. “We now have the capacity to meet the increasing demands of our existing customers while integrating new business.” For this purpose, Hammer is also investing in the technical equipment of the logistics centre, in which an automated small parts storage system will speed up the flow of goods. Among the long-standing customers for whom Hammer performs comprehensive storage and logistics services in Eschweiler is QCG Computer GmbH, a company that assembles and tests complete systems for large data centre operators. “In close coordination with all those involved in the logistics centre, we have integrated a 10,000-square-metre production hall for QCG for server assembly,” explains Christopher Garbe. The 217-metre-wide and 385-metre-long logistics property with 80 gates will be equipped for trouble-free loading and unloading of trucks. The design of the exterior area includes 25 parking spaces for trucks and 200 for cars. “At full capacity, we will employ a total of more than 300 employees in Eschweiler,” notes Wolfgang “Tim” Hammer. An additional advantage is the central location in the Rhineland with excellent connections to transport infrastructure. The location in the intermunicipal business park offers direct access to the A 4; distance to the A 44 motorway is only 12 kilometres, and the economic regions of Aachen and Cologne are also only 24 and 40 kilometres away, respectively. “In addition, the close proximity allows for a close exchange with Aachen University, good cooperation with local partners, and last but not least, the opportunity to meet the latest ecological standards with the new building,” said Hammer’s managing director, emphasizing these further advantages. “With the Logistics Centre Eschweiler, we have further strengthened our position in the market,” he assures.